Leaf Insect photo by Luc Viatour Photography. Leaf insects (Phyllium giganteum) are insects that look more like leaves than animals. The Phyllium genus has several species that resemble leaves, but Phyllium giganteum are the largest of the leaf insects. They are native to Asian rainforests. Because they resemble a leaf, leaf insects are well camouflaged and are not usually subject to predation from carnivores, such as birds, amphibians, and reptiles. However, they could be mistaken as food by herbivores! Leaf insects are herbivores (plant eaters) themselves. They typically feed on oak, guava, and blackberry leaves. Because leaf insects are so unusual in that they appear to be part plant and part animal, some people keep them as pets. However, you should only attempt to keep leaf insects as pets if you are able to properly care for them. Here is a link to an excellent Leaf Insect Care Sheet. 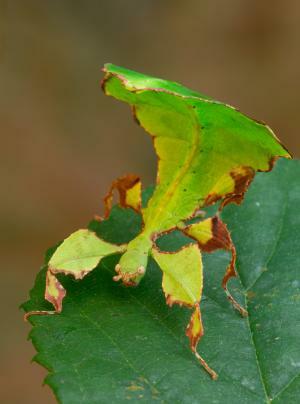 Image of leaf insect © Luc Viatour and published under the the GNU Free Documentation License. Image has been resized. Copyright © 2009-2018 RainforestFauna.com All rights reserved.